Photo courtesy of Bill R.
No peasant starch is used in the manufacture of these cookies, then? – What are you doing, Madam? – Then go and taste someone else! Rock out with your tongue out! Someone’s been tossing their cookies. 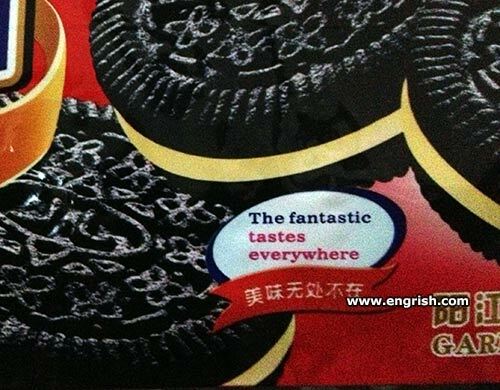 I see these bikkies are integrated. Black on top white below. Actually they are more fun than I thought. Black above and below, white in the middle. – Oh Mr Belpit, your tastes are so swollen! Well. At least it doesn’t come with fliggin lice. Maybe they are Lice Clackers. @Pete 9:35am; Among the Fantastic Four, Rubber Man has always been my favorite. @Pete 9:35am: Oh, so that’s what this guy was eating!